Video Recipe - One of the best snacks you can, well snack on, is also one of the easiest to make yourself. If you make them yourself, they are also much better than the ones you buy pre-popped. Warm and fresh. Maybe even made with clarified butter instead of oil. I get so sad when I see someone buying popcorn in bags from the supermarket when the homemade ones are twice as good. Maybe they are even 3.1415 times better !? So make them yourself ... right? Please! 2 tbsp clarified butter, ghee or tasteless oil (a little less than ½ dl (1/4 cup)). Ready a big bowl for putting the popcorn into as soon as they are finished. Otherwise, they burn very easily. Add the corn and butter/oil in a 4 liter (1 gallon) pot. Heat the pan up by medium to high heat. As soon as the corn starts to pop you should put the lid on. When they stop popping, or it at least slow down a lot, then shake the pan so that any unpopped corn end back on the bottom of the pan and pops too. Place the pot back on the heat. Repeat shaking / popping routine until there is absolutely no more pops. Be careful not to burn them though. 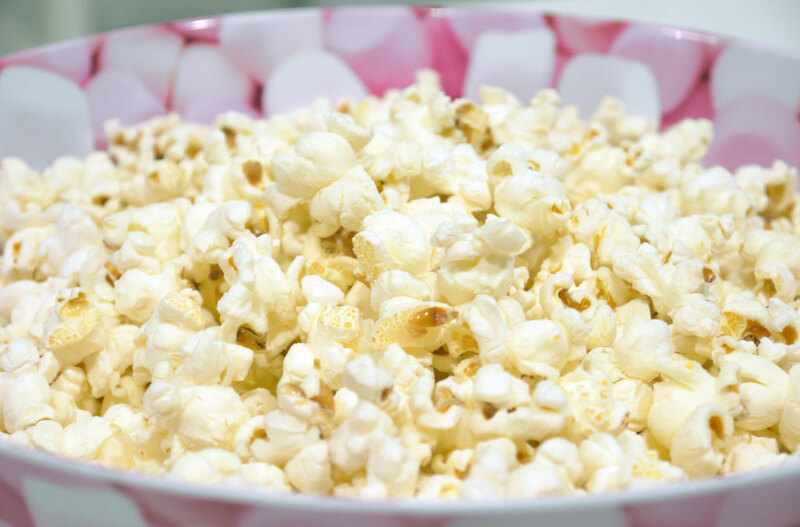 As soon as it is possible without the popcorn overflowing, you should remove the lid to allow the steam to escape. That will make them stay crisp longer. Popcorn Maize is a special variety. You can not use other types of corn to make popcorn, and you can not use popcorn corn to make other kinds of food with. The thick shell traps so much steam that they can make the pop, but it also prevents that they can be soaked in water. They can be purchased in almost all supermarkets. I think popcorn taste best with clarified butter. It gives them a light butter flavor. Others in the family like them better with oil. Corn oil, canola oil, sunflower seed oil, etc..'s They are all good.